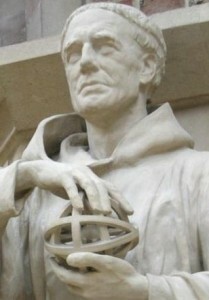 Was Roger Bacon Europe's first real scientist? This 13th-century English monk recognized that going to the source of phenomena was the surest way to understand them. Bacon was born in Ilchester, in Somerset, around the time King John granted the English nobles some important rights in the Magna Carta of 1215. Education was apparently an important value in his family, and he went to Oxford University probably at about age 13. Bacon lectured at the University of Paris and pursued a life of dogged intellectual inquiry at a time when unorthodox opinions were dangerous — even fatal. At about the age of 40, he became a Franciscan friar, which limited his ability to publish his works, as any writings had to be approved by his order. About 10 years later, though, his friend Guy le Gros de Foulques became Pope Clement IV. During the few years of Clement's reign, Bacon published his Opus Maius, about science and theology, and other works. Bacon understood that mathematics was crucial to understanding science. He refused to accept received knowledge without testing out its tenets with experiments — and at the time, the scholarly world was all about received knowledge from the ancients. He created the first useful maps in hundreds of years by re-introducing map projections, he was a pioneer in the field of optics, and he began a reformation of the calendar that was adopted hundreds of years later by Pope Gregory XIII.